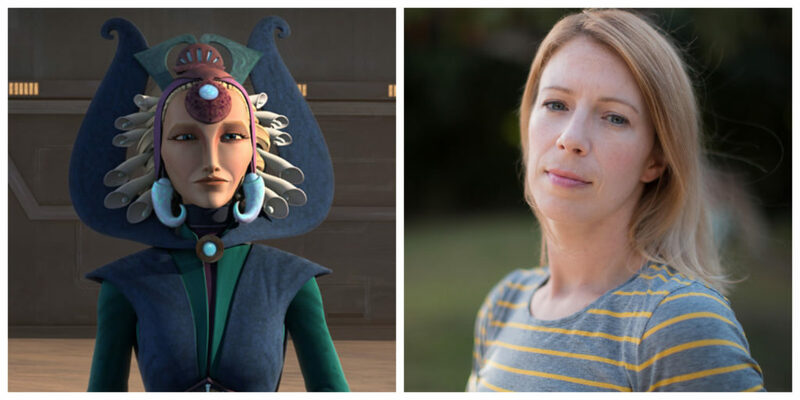 Anna Graves voiced Satine Kryze in The Clone Wars as well as several other characters in The Clone Wars, Star Wars Rebels, and Star Wars video games. Some of the additional characters Graves voiced in The Clone Wars include the bounty hunters Sugi and Rumi Paramita, Senator Meena Tills, Jedi sisters Tiplar and Tiplee, and handmaiden Teckla Minnau. In Star Wars Rebels Graves voiced Nightsister Ghost Sabine and Phoenix Four. In Star Wars video games Graves voiced Princess Leia in Disney Infinity 3.0 and Admiral Zasha Ranken in Star Wars: The Old Republic. Anna answered a few questions via email for this interview with 365 Days of Star Wars Women. I was born in 1978 so Star Wars was in the air, in the water, it was everywhere. So as a kid, they became my favorite movies to watch with my family. I still have our Star Wars trilogy of Episode IV, V, & VI on VHS! I watched them over and over. Fell in love with Han. Wanted to be Leia. Wanted to study with Luke and Yoda. Wanted to live with a few Ewoks and travel the galaxy…I still love everything Star Wars! I was a little dancer and singer and performed in musicals growing up in Tennessee. And I used to love listening to children’s books on vinyl. I’d narrate stories and make up songs that I’d record on my Fisher Price tape recorder. After I moved to Los Angeles, I eventually stopped doing free theater and started spending my evenings taking every voice over class I could. I was lucky that my first agent, whom I’m still with to this day, was across the street from my office. I spent my lunch breaks at auditions. By the end of that year voice acting was my only job… my dream job! When you audition for a voice acting role do you usually know the character and series you are auditioning for or is it sometimes kept secret? Sometimes I’m given A LOT of information about the character and role and sometimes a teeny tiny bit of info. But a character’s voice is always a big question and you’re trying to figure out the answer. So I always give casting directors one take of what they’re asking for and then one take with a twist of my interpretation of the character. Satine in The Clone Wars episode “Duchess of Mandalore”. What was your first Star Wars voice acting role and what was that audition like? Oooo- First Star Wars role was the Duchess Satine of Mandalore in Star Wars: The Clone Wars. My audition was through my agent and I submitted one take for the role. Shortly thereafter got a callback. It was very nerve-wracking for me and it was my first time in front of the legendary Sue Blu, who was running the callbacks. When I left I felt confident that I had done the best audition I could do and it was out of my hands at that point. And when I got the call that I had booked the role, I screamed. I was over the moon excited! I dig both mediums! And every voice-over session is different, depending on the project and who is directing. It’s the most fun to record an animated series with the other performers in the scene. Because it’s like radio theater and you feel the flow of the scene. But most of the time, you are the only one in the booth. So I love working with VO directors that know how to pull specific emotional responses out of me. Video games can be hard work, especially if you’re trying to record a whole games worth of material into one VO session. But a lot of the time you come back for multiple sessions over the course of months or years. It’s so satisfying to voice a character in a game that has a big story arc and you feel connected to that character by the time you finish recording. 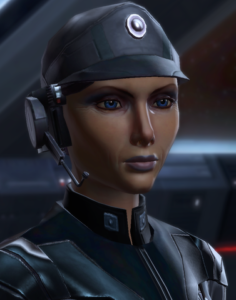 Zasha Ranken in Star Wars: The Old Republic. In Star Wars video games you have played Rebels (Princess Leia) and Imperials (Zasha Ranken). Was it fun to play someone who favored the Dark Side of the Force for a change? I love being on the dark side… shhh, don’t tell the Rebels. It’s always fun being the evil, dark, brooding one that you love to hate. And sometimes they yell and scream a lot, which can be quite therapeutic. And nothing beats doing a good maniacal laugh! You have portrayed beloved Star Wars characters (like Princess Leia in the video game Disney 3.0) and new Star Wars characters (like Satine Kryze in The Clone Wars). Can you let us know how you went about finding the right voice for each of these characters? Was one of them significantly harder to get right? Creating a character from the ground up is always fun because you’re layering… age, personality, timber, emotional responses. And for Princess Leia, I was excited to honor everything that people already loved about Carrie Fisher’s performance in Episode IV but I also got to have fun with her spunky, fighting spirit so hopefully the player in the game would really enjoy stepping into this world as Princess Leia. Do you have a favorite Satine episode? Or a favorite memory of working on The Clone Wars? I walked into every Duchess Satine scene with a lot of gumption! She challenges everyone around her. Challenging the Republic, I loved pleading my case to the Chancellor, voiced by the late great Ian Abercrombie, in “Duchess of Mandalore”. Challenging Mandalorian values to Almac (loved scenes with Julian Holloway) who was constantly opposing Satine’s views even when he appeared supportive. Challenging extremism and hate in Death Watch and Darth Maul. But my favorite scenes were always when Satine was challenging Obi-Wan. James Arnold Taylor and I really loved and respected the relationship between the two characters. And where fans got to meet the Duchess, she is at such a crossroads with her feelings about Obi-Wan as well as a crossroads in her leadership of Mandalore. I loved performing the fight scenes between Satine and Obi-Wan when they are trying to find a way to support each other as well as fight a system that is much larger than them both. There are many frustrating moments that the audience experiences with them. And the heartbreak that fans have felt for Satine and Obi in the episode “The Lawless” is the same heartbreak we felt while recording the show. How much time did you get to rehearse for episodes of The Clone Wars? We received the scripts when we showed up to record. So after I’d read the script, it’d be time to jump into the studio and director, Dave Filoni, would then discuss with us every scene and fill in any holes that we were missing. If I was voicing a new character then Dave would help me find a voice for them and really flesh out the character before we recorded. Then, all together, we’d record the rehearsal as take 1. And we usually did three takes of each scene. Sugi in The Clone Wars. 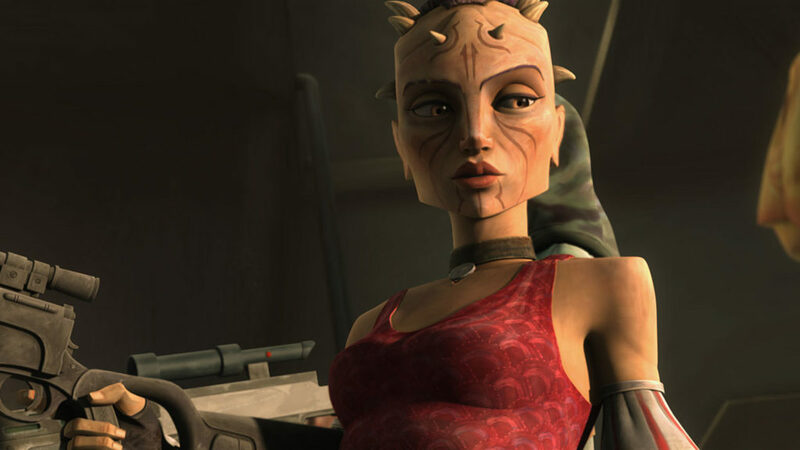 In The Clone Wars in addition to voicing Satine you portrayed many other characters including Sugi, Tiplee, Teckla Minau, Kin Robb, and Meena Tills. Do you have a favorite of any of these characters? I loved voicing the bounty hunter Sugi because she was a badass lady… sassy bad. And I had scenes where my character was fighting with Jim Cummings (Hondo)… that was monumentally great for me. 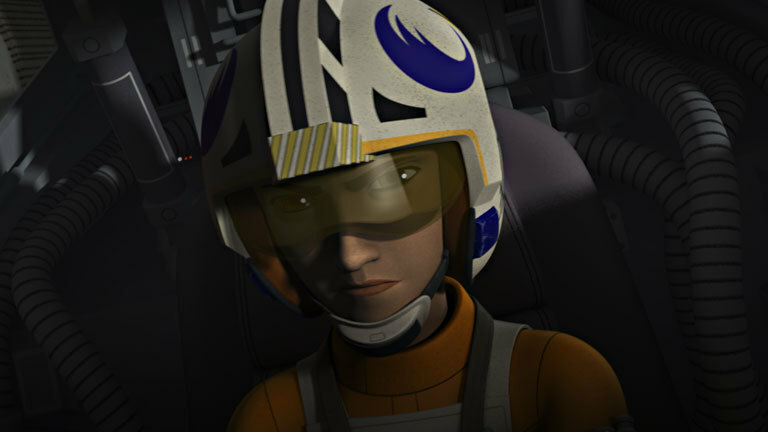 Can you talk about the characters you voiced in the Star Wars Rebels episodes “Visions and Voices” and “Rebel Assault”? For Rebels “Visions and Voices” I was brought in to voice the spirit of the Nightsister that possesses Sabine. This was really cool because I portrayed someone that even Darth Maul was frightened of… which was satisfying (watch The Clone Wars episode “The Lawless” to see what I mean). And Sabine is Mandalorian just as Satine was Mandalorian. So it was great getting to portray a new character that ties into these older storylines that were so important in Clone Wars. Dave Filoni really understands Star Wars fans and he purposefully asked me to come in for this specific role. And it was really awesome because Meredith Salenger, from Clone Wars, came in to voice the possessed Kanan. So we had a lot of fun making these characters creepily sinister and dark… screeching our heads off together! When I came back for “Rebel Assault” it was exciting to be fighting alongside Hera. I loved doing that scene with Vanessa Marshall because she’s such a strong character to perform alongside. And the fact that my character was flying and X-Wing… that was pretty epic for me. Are there any characters you would love to play in future Star Wars projects? I would love to play more parts that are inspirationally fun for kids, someone that my own kids could look up to. But I’d also like to play more characters on the Darkside. The newer animated series and films have really opened up a closer look into the lives of those who fight for the Empire. And I find those characters equally intriguing to watch. I’d love to voice Phasma and journey through her life… what an interesting life it must have been. Have you had many interactions with Star Wars fans? I have had so many positive interactions with Star Wars fans! After years of only socializing on social media, it was really nice to recently get out of the house and meet fans face-to-face at the Salt Lake City Comic Convention Fan X. And James Arnold Taylor and I even got to officiate an “Obitine” wedding! Here’s the story: There’s a couple in Utah, that I was already aware of, that cosplay the characters of Duchess Satine and Obi-Wan Kenobi. The first day they MET, they watched the Mandalorian episodes of TCW (Season 2). They both immediately fell in love with the characters and began cosplaying as them. Eventually, they realized they had fallen in love with each other and got engaged. They had a small wedding that most of their friends could not attend. So they planned an “Obitine” Wedding to take place a month after their official wedding. When the groom asked if I would officiate their Star Wars wedding, I realized how important these characters were to them! 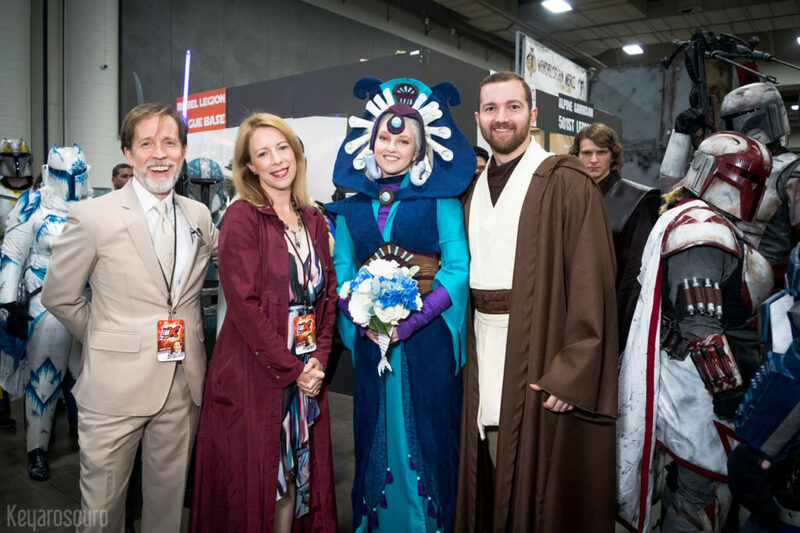 So James and I were fortunate enough to attend the Con as signing guests and be there to officiate the Star Wars wedding of “Satine” and “Obi-Wan”. And I cannot express the level of happiness I felt being there. And that James was there, and the Mandalorian Mercs and 501st that were in the room to support this LOVELY couple, who got their dream party wedding! James and I even asked TCW writer Henry Gilroy to write a ceremonial script for the big day, which he did, and it was poetry. What’s your favorite non-Star Wars acting role you have done? Some of my favorite voiceover roles have been parts so small that they fly by you. Or there are parts that are my favorite just because of who is in the room with me or who’s directing. There was a small role that I did for the Netflix series Big Mouth, where I had the pleasure of working with Nathan Filion. And even though only one of my lines made it into the show, I’ll always remember how great that session was and how much fun it was goofing around with Nathan and the director. Or the time I worked on The Orville and Seth MacFarlane directed me in this hilariously small bit that didn’t even make it on screen. But the more I’m asked to do as a performer, the more I learn about myself and stretch past the boundaries and limitations that I sometimes impose upon myself. 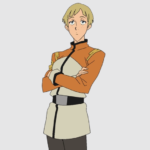 Ina Leifsdottir in Voltron: Legendary Defender. My newest role that I’m happy to share is Leifsdottir in the show Voltron: Legendary Defender (streaming on Netflix). I was ecstatic to work on the show because I’m SUCH a big fan! She’s an M.F.E. Pilot who is intelligent and a quick-witted kid. And the bonus was that Andrea Romano was directing. Whenever I got a chance to work with Andrea it was wonderful, and I knew she cared just as much about my performance as I did. I’m also proud to have reprised my role of Anna for the new game Metro: Exodus, which will be released 2.22.19. It’s inspired by Dimitry Glukhovsky’s novel, Metro 2035. So there’s still time to read the book before you play the game!